Saint John, the beloved disciple of Jesus and Mary, was privileged to behold a wonderful sign in Heaven, "A Woman clothed with the sun, and the moon was under her feet, and upon her head a crown of twelve stars." This gave rise to the Crown of Twelve Stars devotion which Heaven has blessed with countless favors. Saint John Berchmans made it his daily favorite. 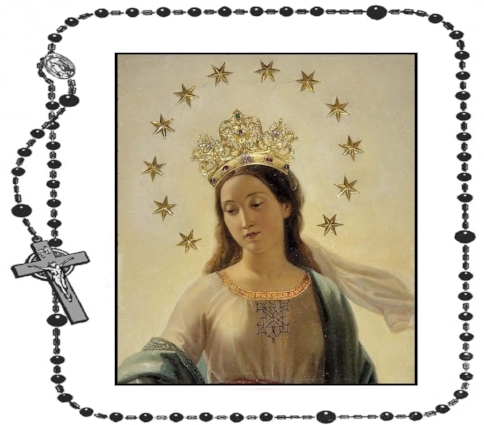 This chaplet is prayed to honor each of those 12 stars as they symbolize her motherhood and queenship over all Israel, the 12 stars representing the 12 Tribes and the 12 Apostles. This devotion consists of 12 Aves, one for each star. It is broken up into three groups; each group representing an aspect of Mary's virtues: excellence, power, and goodness.